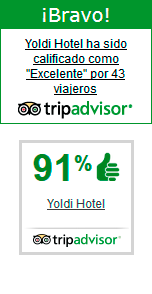 The Hotel Yoldi is a contemporary and functional hotel located right in the heart of Pamplona, close to the Príncipe de Viana square and less than 5 minutes walk away from the Plaza del Castillo square, the Estafeta street, the Plaza del Ayuntamiento (city hall square) and the Plaza de Toros (Bull ring). The hotel is strategically located at number 11 of San Ignacio avenue, with easy access to the main roads in and out of the city (Avenida Zaragoza avenue, Baja Navarra road and Avenida Guipúzcoa avenue), and also to the nearby Noáin airport and public transport services. In addition, the Hotel Yoldi is ideally placed to visit the Citadel, the Cathedral of Santa María and the Museum of Navarra, or simply to stroll around the streets of the Old Quarters of Pamplona. Its 50 guest rooms are spacious, comfortable and recently refurbished for the utmost satisfaction of our guests. All guest rooms have a refurbished bathroom, air conditioning, LCD TV with PC connection, Canal Plus, mini-bar, strong box, radio with Ipod connection and free WIFI in all rooms. What’s more, you can enjoy our efficient room service with a menu offering a variety of products, including our sumptuous Navarre tapas, “cazuelicas” (small portions of food in an earthenware dish) and our famous hamburguers. The 50 rooms at the Hotel Yoldi in the centre of Pamplona are spacious, comfortable and fully refurbished to give maximum satisfaction. All rooms offer free WIFI, a completely refurbished en-suite bathroom, air conditioning, Led TV, Movistar+, mini bar, strong box and radio with iPod docking. We also offer you our room service with an extensive variety of dishes and appetizers, including Navarre tapas and “cazuelicas” (small portions served in earthenware dishes) and our famous hamburgers. Your pets are part of the family. As we ALWAYS want you to enjoy your stay here. We’re definitely a pet-friendly hotel, accepting pets in all our rooms, whether these are single, double, triple or quad. Your pets will feel at home, seeing that you want to spend all your time with them. Our strategic location right in the Pamplona city centre offers you many different possibilities of getting the most of your stay in our city. The Hotel Yoldi is located at number 11, Avenida San Ignacio, a street linking the central Príncipe de Viana Square with the Paseo Sarasate walk and the Plaza del Castillo, the emblem of this capital city of Navarre. Within a short walking distance is the Cathedral and the Plaza del Ayuntamiento (Town Hall square). Mondays to Saturdays: 7:30 to 10:30 hours. Opening times for lunch and evening meals 12:30 to 15:30 hours and from 18:00 to 22:00 hours from Omday to Saturday. Sundays and bank holidays from 12:30 to 15:30 h.
Cafeteria-bar opening times from 7:30 to 22:30 hours from Monday to Saturday. Sundays and bank holidays from 08:00 to 16:00 h.